More than 250 top retailers recognize the brand’s amazing growth in a challenging economy. Diageo, the world’s leading, spirits, wine and beer company today announced that its CIROC Ultra Premium Vodka was recognized as ‘Spirits Brand of the Year’ by Market Watch magazine. The award is voted on by more than 250 Market Watch Leaders, a selection of the nation’s top retail executives, for its outstanding performance and unprecedented growth during the 2010 fiscal year in which the brand grew volume by 124% and organic net sales by 128%, outpacing many of its top competitors. The success of CIROC Ultra Premium can be attributed to a combination of award-winning liquids and outstanding marketing in partnership with entertainment entrepreneur Sean “Diddy” Combs. Since Diageo began working with Combs in 2007 to market the brand it has consistently achieved double-digit growth and industry accolades. 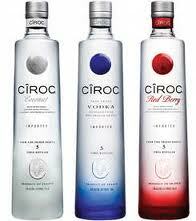 In February 2010 Diageo introduced CIROC Red Berry and CIROC Coconut. In March 2010 CIROC Ultra Premium Vodka was awarded a Double Gold Medal in the extremely competitive vodka category at the prestigious San Francisco World Spirits Competition and for the fourth consecutive year it was named a “Fast Track” brand by Beverage Information Group. Diageo accepted the award at Market Watch magazine’s annual Leaders Awards Dinner, which honored the nation’s foremost spirits, wine and beer retailers. The Leaders Choice Awards are voted on by more than 250 previous Market Watch Leader honorees and recognize the industry’s top performers. Diageo previously accepted the Spirits Brand of the Year award for Crown Royal Canadian Whisky in 2009, Smirnoff Vodka in 2008 and Captain Morgan Original Spiced Rum in 2005. ABOUT DIAGEODiageo (Dee-AH-Gee-O) is the world’s leading premium drinks business with an outstanding collection of beverage alcohol brands across spirits, beer and wine. These brands include Johnnie Walker, Crown Royal, J&B, Windsor, Buchanan’s and Bushmills whiskies, Smirnoff, CIROC and Ketel One vodkas, Baileys, Captain Morgan, Jose Cuervo, Tanqueray and Guinness.